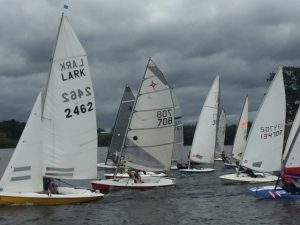 13 boats took part in the two races this Sunday in balmy weather. Both were won by Nick Marlow in his Lark. Overall it is close in each series. Series 1 after four races is led by Kevin Last from Paul Jago and Bob Cuerstemont. Series 2 is led by Paul Jago from Kevin Last and Kevin Milton. Two more weekends to go.